There are many questions to ask when determining the size needed in order to get the perfect fit for your new ring. • It is important to know that our finger size can change throughout the day, usually our fingers are the smallest in the morning and become larger as we become active, especially if we workout, or perform strenuous activities. • Temperature is also important to consider when you are having your finger measured for your new ring. If you have just been outdoors in the extreme cold, your fingers will be smaller, and if you have been in the extreme heat, your fingers will be larger. • Another consideration is which finger will you wear your new ring on? Our dominant hand usually tends to be larger since we use it more often. If you are right handed, your ring finger on your right hand will more than likely be larger than your ring finger on your left hand. • And lastly, the design of the ring can also affect the fit. The wider the ring, the tighter the fit. So, what is the best way to determine your ring size? It is always best to have your finger measured by a jeweler, they have the right tools to not only measure your finger, but also to measure the current size of your new ring in order to determine how many sizes up or down the ring needs to be sized. If that is not possible, here are a couple of other options. 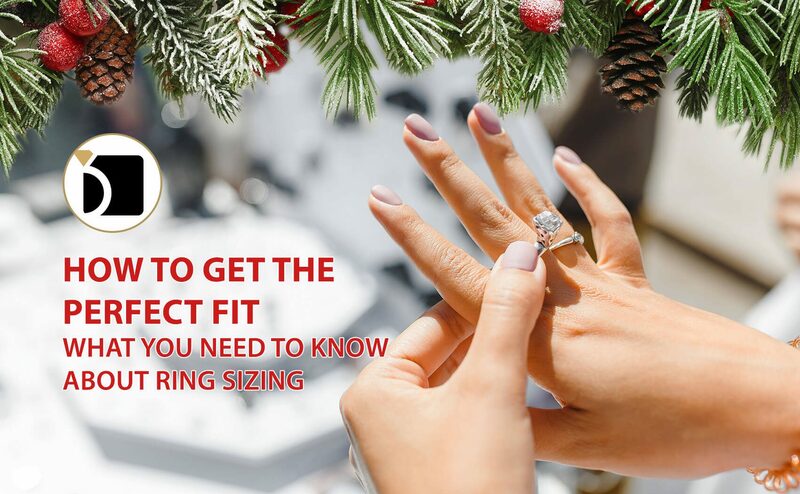 • Use the size of an existing ring in your jewelry collection that is a similar design and is a good fit on the finger you will be wearing your new ring. • Use the paper method of wrapping a strip of paper that is a similar width to your ring around your finger and mark the paper where it begins to overlap. Measure the length of the strip of paper that wrapped around your finger and convert it to your ring size using the chart we have provided for you. Ring sizing is one of the most common repairs we perform at MyJewelryRepair, so your ring will be in good hands. To learn about how much rings can be sized up or down based the different ring types and designs click here.